Having some nostalgic throwback moments right now :D :D :D. One Of my most vivid childhood memories has to do with this popular local sweet. 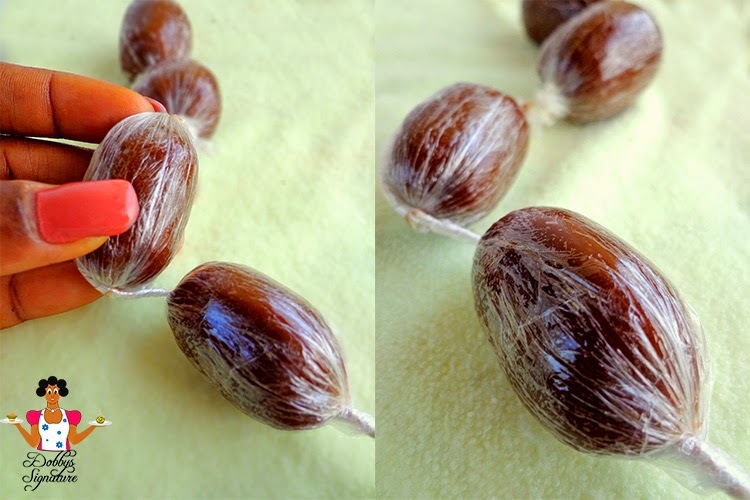 It wasn't the type of sweet you'd find in supermarkets or stores but on the streets where it goes by different names such as 'sweet alagbon','Chalbin mallam', 'Black Tofi', 'gulisua' etc. 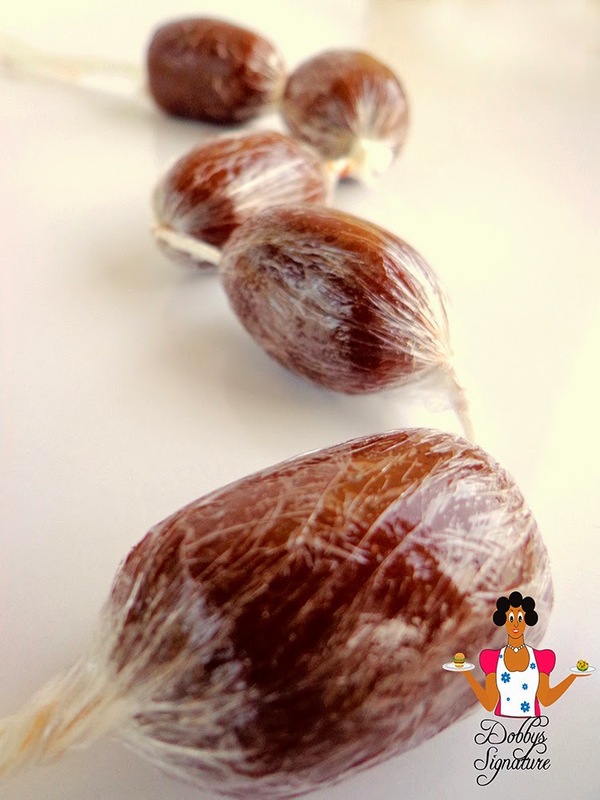 Back then as a kid, my friends and i usually hung strings of baba dudu around our necks as 'Bullets' when playing 'police and thief'. The Teevee stations usually started around 4pm in those days so we always had enough time to play. Those were the simple days when you could actually do a whole lot with 1 naira and below so buying this sweet was no biggie as a kid...lol!. 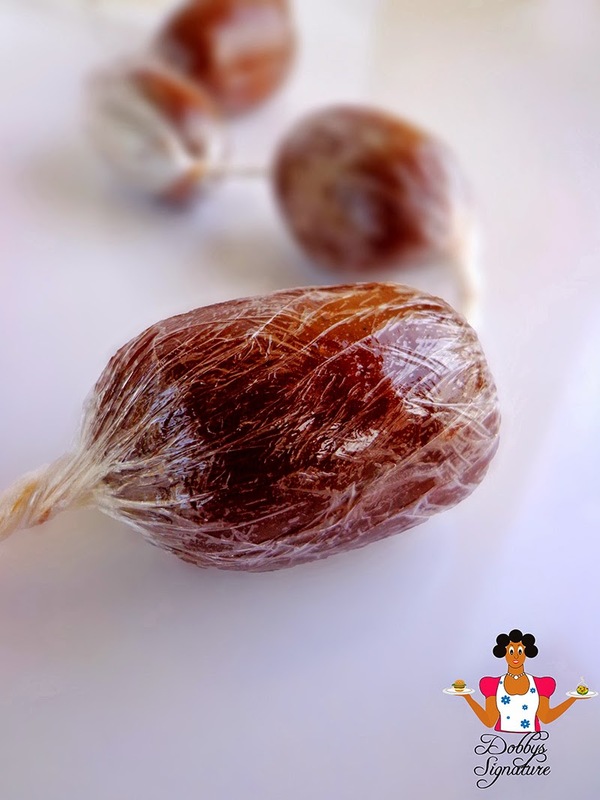 Baba dudu is a dark brown rock hard candy made with coconut milk and sugar then wrapped in transparent nylons and made into strings. Its got a sweet bitter taste but really addictive. Step 2: On medium heat, place the sugar in a separate sauce pan and heat to melt. Step 5: Gently turn off and leave to cool for a very short while. This is done so it wouldn't burn the nylon. Step 6: Open up the nylon and scoop the hot candy into it leaving spaces in between. This should be done quickly because as the candy cools, it hardens. Step 7: Roll up to seal the content and leave to cool further and harden. Just to mention, this is one of the quickest ways to getting Diabetes.....lol! Oh wow! Dobby thanks for this, jux went down memory lane. We call it chalbin mallam in the north, and normally recite it d way we see d moslems do with their beads, when we were kids. This is also part of the children's day celebration, lol. Didnt know it was ds easy to prepare. Loooool! I remember this sweet! Sweet memories, now kids these days are asking for skittles (if I hear). God bless you Dobby! Rotflmao!!! @ skittles...You can say that again cyn....Plus, it gets worse...lol! @ Anonymous3:25: That's so true. i still wonder why they stopped producing goody goody, robo itself is now extinct :(. Can I use caned coconut milk? I just love you Dobby! I'm a big fan. Please can u post the procedure of how to make tapioka. Thanks a lot. Awww!!! thanks anon :). would put tapioca tutorial on the list. I don't understand something Dobby. How did the sugar become brown? It's been added to the list. would put up a post on it soon. Ha, those days- we also had ekona gowon (gowon's finger), tafawa balewa (colored candy). Thx for jogging our memory with this. So much to remember as a child.oh! Baba dudu how long I have missed you. Thanks dobby for putting dis up,will definitely try it. Pls dobby what is tapioka? Lol! you just brought back memories of the day my mum caught me with this sweet. All hell was let loose :D. Thanks Vieve! Dobby the colourful lizard eggs were called ALANGBA eggs. Lol. Beautiful memories. Ah!!! i remember those. I still search for it on the streets of Lagos till today. Don't know what happened to it though.....lol! I am so trying this today. Thanks Dobby you rock. you are welcome Bukola, do keep us posted. Could you please post the recipe for Mr Goody Goody it will be much appreicated. Okay Anon, that'd be added to the list. Nice, just bought some. Pls can you put up how to make sisi pelebe. Can you find and post the recipes and method of making katanga....80s snack,plssssssss. would add that to my list. Pls can you share the recipe for sisi pelebe, i ve been trying to get it for months now. And anytime i try all d recipes online, it doesnt turn out dark brown and the taste is also diff. Thanks.